This image was photographed during the first dance of Sarah and Bryce at the Certus Loft of the Huguenot Mill in Greenville, SC. I love the look on the bride's face, as she smiles and closes her eyes in a moment of pure joy. Bryce's hand, with newly acquired wedding ring, grips Sarah's hand tightly as he kisses her forehead. Sarah and Bryce began their winter day wedding with an evening ceremony at Furman University's Daniel Chapel. Followed by a rockin party at the Certus Loft with music by Rubberband, delicious cake by Kathy and Company, and scrumptious food from GoodLife Catering. Thanks to the wonderful decor and coordination from Upstate I Do and http://www.willowflorals.com, the bokeh and lights in the foreground were wine glasses and candles on the table decorations. And I love how they are mimicked with the lights in the background window. 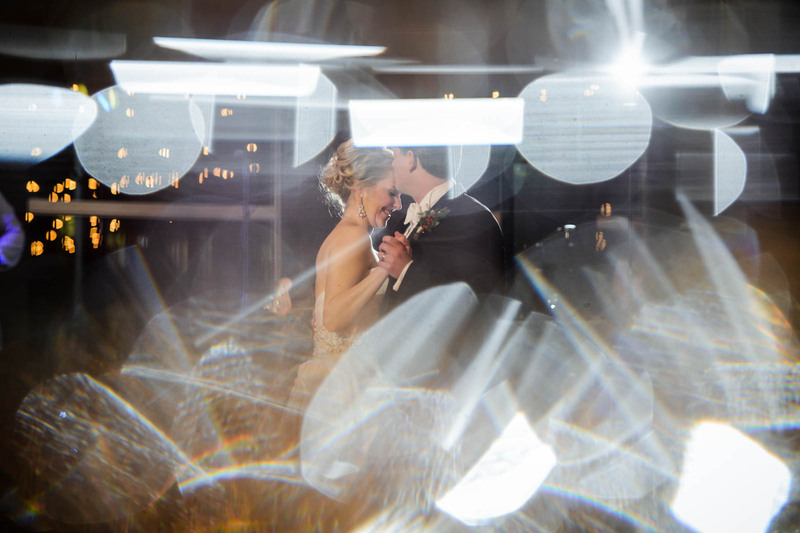 The beautiful rim of light that frames the bride's face is from our off camera flash set up for the first dance. As most photographers would attest, lighting is everything when it comes to photography!